“In the autumn of 1102, Henry l granted Bowland and adjacent estates to Robert de Lacy, and on the 23rd. of November 1102 Robert de Lacy made over to Ralph le Rus (the Red), Mitton, Aighton, Mearley, Twiston, and land in Clitheroe. Ralph le Rus thus became Ralph of Mitton and in 1135 Ilibert de Lacy re-confirmed his fathers gifts to Ralph, who he styled his brother”. – “The Early history of the Parish of Mitton” – Rev. Joseph Mc Nulty, B.A., F. R. Hist.S. Evidence and circumstances seems to support Ralph as a scion of the de Lacy family who were the paramount feudal lords of the de Mitton family manors for over two hundred years. This feudal association begins with the first de Lacy charter to Ralph the Red dated Nov. 23, 1102 and remained as such in the family until the death of Henry de Lacy, the third Earl of Lincoln on Feb. 10, 1311. These lands were the largest alienation of feudal property by the de Lacy’s since they themselves were granted lands by King William I himself. Abet the result of King Henry I granting in1102 the Bowland and Clitheroe lands of Roger Pouti to Robert de Lacy having reverted to the crown after he ran afoul of the King. After Henry de Lacy`s death in 1311 the de Lacy lands went to Thomas Plantagenet husband of Alice de Lacy from a childhood betrothal (age 9) to Thomas, Earl of Lancaster arraigned by her own father Henry de Lacy. Thomas was Edward the 1sts. nephew and this was arraigned early on as Henry de Lacy was King Edward l closest confident. It was a life estate granted by Henry to Thomas Plantagenet. His only other heirs were his two sons and another daughter. All had predeceased him tragically after the betrothal to Ann.. The best laid plans do not always work out as she and Thomas had a contested marriage. But upon Henry’s death the de Lacy lands fell into Thomas`s already considerable lands by right making him the largest land owning Barron in England. Over twice the next closest baron and the military resources to go with such baronies (a total of 5 Earldoms). The direct de Mitton bloodline began from Robert de Lacy, the first de Lacy Lord of Bowland with his illegitimate son Ralph the Red and his desendentss was eventually severed with the death of Henry de Lacy (2) in 1311. The close association of the descendant de Mittons was the de Mittons ceased to be lords of their namesake manor after Henry de Lacy`s death. They were replaced by feudal right by Thomas Plantagenet, then Earl of Lancaster. He was successor paramount lord of Bowland that included the de Mitton family manors. This would not have happened if Henry de Lacy had not died with out a surviving male issue to inherent the de Lacy barony. Their was thus an ending of the bloodline connection of the de Mittons from Robert de Lacy, father of Ralph the Red and the initial granter of the de Mitton manors in 1102 to his illegitimate son (probably by a Saxon mistress). The de Mitton family as lords of their manors perfectly coincides with the same time frame (208 years) with the de Lacy family as the Lords of Bowland and the Honor of Clitheroe. This longevity seemingly confirming the blood relationship so important in those times to holding manors in that era. Bowland included the liberty of Mitton. We can thus precisely date the de Mitton surname family manor holding from the first charter dated Nov. 23, 1102 to the death of the their liege lord, Henry de Lacy, Feb. 5th, 1311. The de Mittons were replaced by 1312 with a new sub-en-feuded family by Thomas Plantagenet, paramount Lord of Bowland over the de Mitton manor. He had no blood connection to the de Mitton family as did the de Lacy`s. As such he could remove the de Mitton family and substitute a family of his own liege (which he did) regardless of his wife, a de Lacy wishes. Ralph le Roux (-after [1135/41]). “Robertus de Lacy” granted “Magnam Merlay…et Tuisleton…et…in Cliderhou” to “Radulpho le Rus” by charter dated 23 Nov 1102. His parentage is confirmed by the charter dated to [1135/41] under which “Ilbertus de Lacy” confirmed the grant of “magnam Mitton, Haghton, magnam Merlay, Twisleton…in Potreton et…in Cliderhou” to “Radulfo le Rouse” and granted further property to “eidem Radulfo fratri meo“. The first charter had a specific date of November 23, 1102. That charter to Ralph was the first mention of a Norman at Clitheroe. This precisely dated charter came very soon after Robert de Lacy had been granted the crown retrieved lands of Roger de Poitou. It was Roger Poitou who had first received those Bowland lands from the Conqueror after the “harrying of the north” in present day Yorkshire. *The second charter was probably after 1135 but before 1138 as Robert, the younger brother of Ilbert, died at the Battle of Standard in 1138. He was a signatory of 1135 charter so that narrows the time frame.1135 is when King Steven, nephew of King Henry l became King of England. Ilbert de Lacy (2) was the heir of Robert de Lacy and a strong supporter of Stephan in the civil war with Matilda. Ilbert father’s grants from King Henry l were confirmed to him by King Steven upon his ascension to the crown and Ilbert ’s barony was returned to him at that time. ‘eidem Radulfo fratri meo’ –the same to my brother Ralph. to Ralph the Red in 1135. He referred to Ralph as ‘ my brother’. This would make Ralph a 4th son of Robert de Lacy although he would be an illegitimate son as refereed to above*. “Ilbert de Lacy confirms his father Robert’s grant to “Ralph the Red” in 1035 after King Stephen returns the Honor of Pontefract to de Lacy`s. No other de Lacy genealogy refers to Ralph the Red as a de Lacy except this charter. And no direct bloodline of a Mitton ever succeeded to the de Lacy Barony when the first male line ended in 1193. Ralph the Reds grandson Hugh de Mitton was a second cousin to Robert de Lacy 2nd., not a direct descendant of Albreda. The bloodline that most directly descends from a recipient of the Conquers grant of land. In this case it would be Albreda. At the very least Ralph must have had a close enough relationship with the de Lacy’s to have received so many manors around Clitheroe and the means to build a church at the magna manor site of Mit-tune (as identified in the Doomsday book). He then becomes its first All Hallows rector at the site of Mit-tune as well as the first lord of the manor. Blood relationships were the currency of the times. It would not be unusual for an illegitimate son of a Norman lord to be so favored for practical purposes as well as of a blood relationship to whatever degree for presumptive loyalty to the paramount lord. The benefit for Ralph was receiving substantial sub-feudal-ed lands in the de Lacy’s honor of Clitheroe and Bowland domains beginning in 1102 by charter grant. The recorded siblings of Ilbert de Lacy are Henry (who succeeds Ilbert) a third brother Robert who died at the Battle of Standard and a sister named Albreda. Albreda’ s descendants figure prominently as the closest heirs to determine the second line of de Lacy’s after 1193. The first direct male line from the conquest ended with Robert (3) (son of Henry) death without heirs in 1193. The Barony was then inherited by Roger fitz Eustance, grandson of Albreda, daughter of the first Albreda of the same name and sister of the first Henry de Lacy. They were all the children of the first Robert de Lacy. Albreda (2) was thus a first cousin to the third Robert de Lacy, he being the last of the original de Lacy’s male descendants from the conquest. Albreda was the closet bloodline descendant to a grantee from the Conqueror; the first Ilbert de Lacy of Normandy and the Conquest. Albreda (2) thus had the paramount claim on the de Lacy barony. But under primogenitor she could not inherent, but she could designate her grandson Roger fitz Eustance as successor. He adopted the de Lacy surname along with the extensive barony lands of that original bloodline de Lacy family of Normandy. Some references have “Ralph the Red” mis-identified as “Robert the Red” or “Jordonus the Red” a suggested brother of Robert or even the first Ilbert de Lacy which is not likely to be true. There are many references to “Ralph the Red” in my research connected to the de Lacy` s but a specific pedigree genealogy connection is lacking. The best legal connection is the charter where Ilbert de Lacy (2) identifies Ralph as his brother and the other circumstances that point to a close relationship with the de Lacy family. Including the family connection to the de Lacy’s on the effigy prominently displayed on the effigy of Sir Richard Shireburne a descendant of Otto de Mitton (Bailey) at Shireburne Chapel, Mytton church at Great Mitton (see Cast in Stone below). There is reference to an unnamed brother and knight from one genealogy record, which could be Ralph but it is not identifiable; “The de Lacy’s family in England and Normandy 1066-1194” by W.E. Wightman. This knight and son could be “Ralph the Red” who owed “knights service” to the de Lacy’s as part of his grant of lands from the 1102 and 1135 charters. Some have said it was a Jordan. But little here to credit such an assumption and unlikely as no de Mitton succeeded to de Lacy lands. The closest to do so would have been Hugh de Mitton in 1193 who was a second cousin, once removed from Robert de Lacy ll who died as we have noted without issue. He would have had no claim as he was the grandson of Ralph the Red who was an *illegitimate de Lacy by the first Robert de Lacy. Wrightman does not credit Ralph in any way a de Lacy and only refers to certain positions of close cooperation between the feudal lords and their stewards in the administration of the vast de Lacy lands of the 12th to 14th century. Those lands became huge huge family holdings requiring close associations with sub-administration. Ilbert de Lacy also mentions a brother who dies at the “Battle of Standard” in 1338. This appears to be his youngest brother Robert who is documented and a signatory to the second charter to Ralph the Red in 1135. His death is on the day of the battle Aug. 22, 1138. Previous to the “Standard” battle of 1138 another battle had taken place at Edisford near Clitheroe about six months previously which the Scots won. Both battles were in Ralph’s neighborhood, if not right outside his own front door at Clitheroe Castle and probably on lands part of (Ralph`s) parish holdings. He would have been required to participate to defend as he owed “knights service” to the de Lacy`s. Other information indicates “Ralph the Red” lived into the 1140s and died after Ilbert in 1141. This may be more credible lacking specific information. That’s an interesting question. Wealthy Norman nobles would normally be buried in a monastic foundation where the monks were available to pray for their souls. If Ralph was Robert’s son, and I think he was, my guess would be that he would want to be buried in a friary or priory. So, yes, it is possible he (Ralph the Red) is buried at Pontefract prior. Ilbert de Lacy identified “Ralph the Red” as his brother in the charter of 1135. That document was recorded and witnessed and would be held up in a medieval court, which was the charter purpose intended. Coupled with the early Norman takeover from the Saxons feudal lands most feudal lands were first granted to blood relationships making Ralph’s blood relationship to the de Lacy`s entirely credible from such an early post conquest date of 1102.. The major manors that Ralph received in 1102 including a manor at Clitheroe castle. This included land within and outside the parapets as well as along the “oats line” signifies a important relationship to the de Lacy`s for defensive purposes. They (the de Lacy`s) who had only just come into these holdings from the crown had immediately made the grants to Ralph the Red constituting the largest alienation of sub-feuded de Lacy lands to date. The manor land “in and around the castle rock” previously belonged to an English/Saxon named Orm. The charter grant would seemingly confirm Ralph not only a Norman but most likely of a de Lacy bloodline connection for such strategic manor grants by that family. Their were just not that many Normans early on in such a remote area and Ralph was the first Norman to establish a real presence at Clitheroe as documented by the Nov. 23, 1102 charter. It made Ralph occupation crucial to the de Lacy family as Clitheroe became the de Lacy administrative site for their Barony. Ralph was designate by both Ilbert and his father Robert in the charters endorsed him as a reliable liege to receive so many “demainse” manor grants at such strategic locations and proxy surrounding “magna” manors. More so these feudal manor grants by the de Lacy`s did not go to the de Lacy brothers who confirmed the grants of their father. Ralph was undoubtedly an ally of Ilbert de Lacy (2) in recovering his Barony under King Stephan and protecting it from the Scots incursions at the the battle of Clitheroe and Standard in 1138. The second witness charter was issued in 1135 by Roberts successor Ilbert de Lacy to Ralph the Red once again indicating his status within the de Lacy family. A 15th century carved in stone family connection designated by Sir. Richard Shireburne`s effigy at the Shireburne Chapel, Mitton church? Another important visual finding if not hard to dispute to Ralph’s Norman ancestry is on a descendant Shireburne family effigy at Mitton church. Ralph the Red is identified as the founder and first rector of that church in 1103. Of note: the next three rectors were all named Ralph and were his family descendants under the custom of the day as rectors. This continued at least until 1215 when the Lateran Council forbade the clergy to marry. The Shireburns, as scions of the de Baileys and their precursors the de Mittons regarded Mitton church as their family church as descendants of Ralph the Red on whose ancient manor lands Stonyhurst is. The Shireburnes continued to hold Stonyhurst until the 18th. century and Mitton church remained their ancestral family church for all the Shireburn families rites of passage; from birth to death. There is a prominent de Lacy “rapacious eagle” as part of the connecting families insignia arms on the side of Sir Richard Shireburnes effigy. A stone mason has suggested the four quadrants were unusual in itself. The de Lacy rapacious eagle insignia shows prominently on Sir Richard Shireburnes effigy. 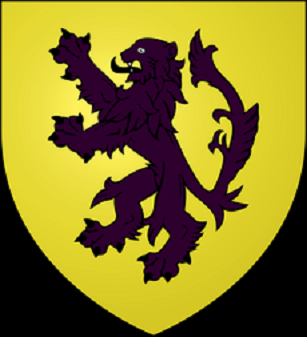 This was too denote the Shireburns as a descendant family blood line connection to the de Lacy`s. Sir Richard was a devoted genealogist and displayed his family genealogy connection not just on his own effigy, but by the church chapel itself thereafter as the repository of his families multi- generational effigies in the renamed Shireburne chapel. The family chapel as such was an addendum to Mitton church whose founder was Ralph the Red and his paternal ancestor. 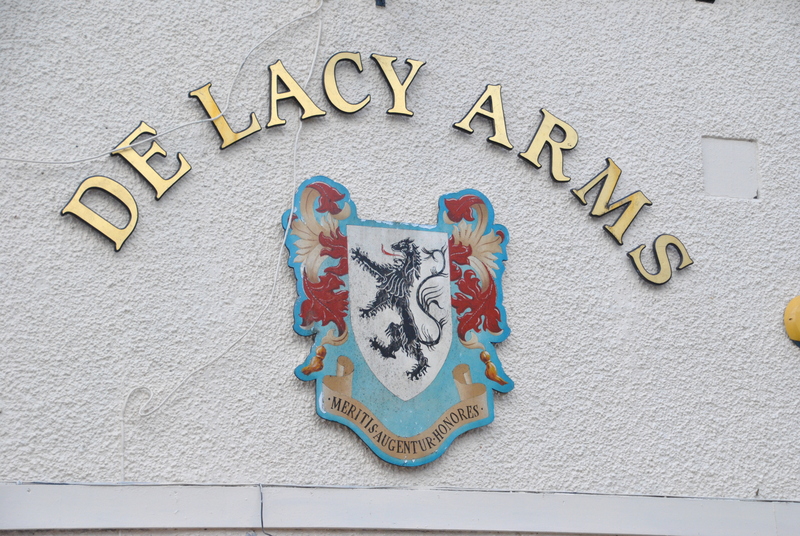 The historic arms of Henry de Lacy. Sir Richard Shireburne uses the de Lacy rapacious eagle as part of his coat of arms on his personal effigy from the 15th century at Mitton churches Shireburn chapel. Coats of arms on effigies were known to denote the family connections. His wife has only one symbol as example. We know that on the outside wall of the Shireburne Chapel of Mitton church has that same Baily-Swinburne coat of arms. This was created to combine the Baileys and the Shireburne family after the marriage of Margarete Shireburn and Richard Bailey and the birth of their son in 1382 the first Richard Shireburn (Bailey) of Stonyhurst Hall*. “Coats of Arms” were applied for and strictly controlled and only came about after the 14thcentury. “Rapaceus eagle” meaning a ferrous bird denoting the de Lacy’s as a historically powerful family of the conquest and the realm on the effigy of Sir Richard Shireburne at the Shireburn chapel, Mitton church. This was the ancient family church connecting the family to Ralph the Red, the founder in 1103 and a 4th son of Robert de Lacy (DOD circa 1122). Robert was the first de Lacy to be Lord of Bowland. Henry de Lacy, 3rd. Earl of Lincoln was the 9th and the last male de Lacy Lord of Bowland until his death Feb. 5th, 1311. The below is the death mask of Henry de Lacy on a wall at Whalley Abby off Mitton Rd. that depicts the same Rapaceus eagle on Sir Richard Shireburns effigy at the Shireburne Chapel inside of Mitton Church. Sir Richard was a descendant of Otto de Mitton or sometimes known as Otto de Bailey grandson of Ralph the Red, the founder of All Hallows church at Mitton. Ralph the Red was progenitor of the Mitton family. Sir Richard was very keen on his ancestry back to Ralph the Red and the de Lacy`s and denoted on his effigy the prominence of the de Lacy “ Rapaceus eagle”. This is further evidence of the connection of the de Mittons as scions of the de Lacy family deriving from the primogenitor Ralph the Red, founder of now called Mitton church where the Shireburn family Chapel was built centuries later.. Above faint outline of de Lacy lion rampart similar to the one below on Sir Richard Shireburns in the Shireburn chapel at the family`s church at Great Mitton. Coat of Arms on Sir Richard’s tomb in Mitton church. The male paternal Shireburn families before 1381 were Baileys, who were descendants from Otto de Mitton who had received Bailey manor from his brother Hugh. There were six generations of Baileys back to Otto de Mitton when he was known as Otto de Mitton or Bailey after receiving Bailey manor from his elder brother Hugh de Mitton, then lord of the de Mitton demainses. It seems that Sir Richard (and there are at least a half dozen Sir Richards entombed at Mitton church) was identifying on his effigy that his ancestral family went back to the Conquest. And why such prominent Catholic Shireburnes choose to be buried in what came to be an Anglican “Mytton Church” at Great Mitton. It was their father’s side paternal Bailey lineages on the coat of arms at that church. The first only Bayley issued Shireburne son, Richard born in 1381 took his mothers family surname, Shireburne. There is little else to denote that side of the family there. The Shireburnes were probably/maybe more of Saxon descent, not Norman as were the Baileys and Mittons. The Shireburnes ​could thus trace their ancestry back to the de Lacy`s of the Conquest and the paramount lords of the de Mittons for over 200 years. All Hallows at Mitton or as now called Mitton Church is the ancestral church of the Shireburnes. The family always used this church for baptisms, marriages and entombment even though they remained devout Catholics after the Reformation. The connection to “Ralph the Red” and the Mitton ancestry by the Shireburnes is thus very strong. Important family religious occasions of the family were always at Mitton church and not at the Catholic Stonyhurst chapel. In a final note of piety when Robertus de Mitton, son of Hugh de Mitton granted his “right of patronage of the church of Mitton to Cockersand Abby with all the appurtenances” (sometime between 1206 and 1235). He did so for the souls of Roger de Lacy and John de Lacy as well as his own mother and father. This suggest a blood relationship beyond just that for a liege lord. Another indication of a feudal connection if not a bloodline one. Combine this evidence with the original remote Clitheroe family location of the first line of the de Lacy`s just after the Conquest. It is a short distance of the ancestral locations of the Mittons, Baileys and Sherburnes. The “charter evidence” as well as other circumstantial thesis is that Ralph the Red’s ancestry was rooted in a very early Norman line of de Lacy`s from the Conquest of 1066. 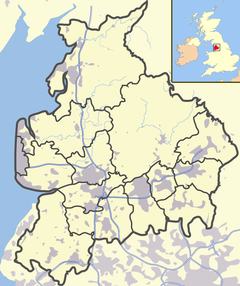 Location of Stonyhurst and Great Mitton in Lancashire today. Stonyhurst is less than two miles from Mitton church in Great Mitton. Great Mitton Hall is adjacent to the church and Clitheroe about three miles to the east. Whalley Abby built by Henry de Lacy is down the road from Great Mitton.